ABU DHABI (Reuters) - Tens of thousands of Catholics and several thousand Muslims attended an unprecedented public celebration of Mass on Tuesday by Pope Francis, the first pontiff in history to visit the Arabian Peninsula. 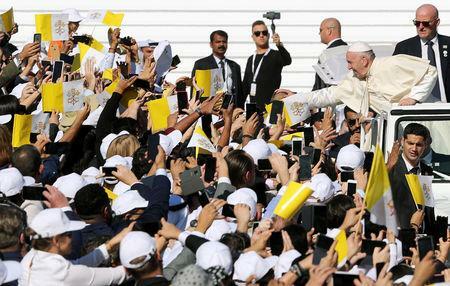 More than 120,000 worshippers packed Zayed Sports City stadium and its surroundings in Abu Dhabi, the capital of the United Arab Emirates, to see the pope, who is in the Gulf country to promote inter-faith dialogue. The UAE hosts about half of the two million expatriate Catholics living on the peninsula, home to the birthplace of Islam in neighbouring Saudi Arabia. The community includes large numbers of people from the Philippines and India. "It is most certainly not easy for you to live far from home, missing the affection of your loved ones, and perhaps also feeling uncertainty about the future," the pope said, telling those gathered to draw inspiration from Saint Anthony the Abbot, the founder of monasticism in the desert. "The Lord specializes in doing new things; he can even open paths in the desert," he said at the end of a trip where he met with the grand imam of Egypt's Al-Azhar mosque and UAE leaders. Francis entered the stadium in a white open top jeep to roars from the crowd. People wearing white baseball caps emblazoned with the visit logo packed the stadium stands and snapped pictures on their smartphones. Thousands of people cheering and waving Vatican flags lined the entrance to the stadium, with the Sheikh Zayed Grand Mosque and Abu Dhabi's skyscrapers glinting in the distance. "For me as a Christian, this is one of the most important days of my life," said Thomas Tijo, a 44-year-old from India's southern state of Kerala, who lives in the UAE and travelled by bus in the early hours to get to the stadium. "We are a long way from home and this is like a comforting blanket," he said, holding his three-year-old son, Marcus. Organisers said Catholics from about 100 nations were expected to attend the Mass, along with about 4,000 Muslims, including government officials. 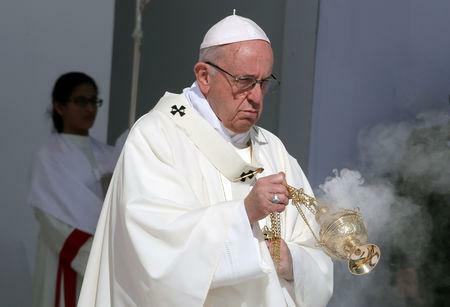 The pope, who arrived on Sunday at the invitation of Abu Dhabi's crown prince, has used the visit to condemn regional wars, including that in Yemen, the poorest country in the Peninsula, where the UAE is involved as part of a Saudi-led military coalition. He also called for greater cooperation between Christians and Muslims. "The pope has made pleas for ending the Yemen war, greater tolerance and more," said Lina Ghattas, a 48-year-old Egyptian who had travelled from Bahrain. "I am not sure what will change: time will tell - hope, hope," she said. 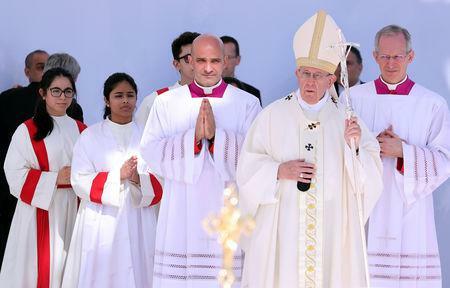 During the service the pope spoke in Italian and English, which is widely spoken in the UAE where expatriates outnumber Emiratis nine to one. The congregation prayed for migrant workers and their families and for the ending of wars. The ceremony ended with a prayer, a thunderous round of applause from the crowd and organ music. "It’s a dream come true. I feel blessed," said Rio Chavez, a 40-year-old security officer who has been in the UAE for five years. He had called his wife and mother back home in the Philippines before the Mass so the pope's message about being far from home and loved ones had resonated for him. "I feel renewed, positive, he is an inspiration for me and my family. I will work very hard to bring my family here, I have the pope's blessings now," he said. A central part of the Christian faith, the Mass commemorates Jesus' Last Supper with his apostles on the night before he died. Catholics believe the communion host and wine become the body and blood of Christ when consecrated by a priest during the Mass. Catholics believe the pope is the vicar of Christ on earth, so participating in a papal Mass is particularly special. Priests and diplomats describe the UAE as one of the least restrictive environments in the Gulf for Christian worship, which is allowed in church compounds with special licenses. There are more than 40 churches, nine of them for Catholics. "This pope's voice is heard, so our hope and prayer is that this historic visit brings peace to this strife-torn region," said Clitus Almeida, an Indian engineer who works in Dubai. "Given the number of Catholics there is a dire need for more churches in the UAE," he said, voicing hope that Saudi Arabia, where churches are banned, would also allow them. Although there has been no official comment from Riyadh, the pope has featured on the front pages of some of the main newspapers, which ran pictures of Francis' meetings with the grand imam of Al-Azhar in Abu Dhabi on Monday and UAE officials. An opinion piece in Saudi-owned, pan-Arab daily Asharq al-Awsat praised the visit and its message of tolerance and coexistence, which it said confronted a discourse of extremism in the region. "The Arab region...for a very long time allowed rigid voices to hijack religious discourse, and it is time to correct the error."